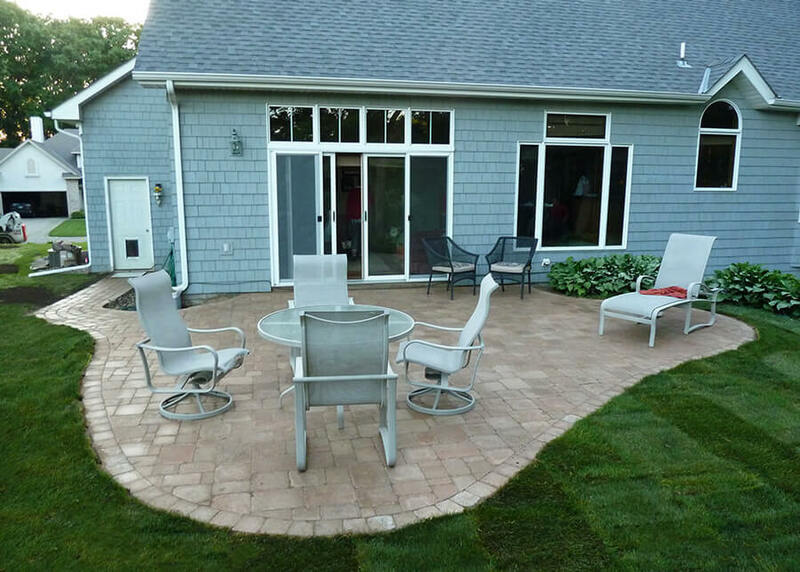 How much do paver patios cost, and how do paver patios compare to concrete slabs? We're here to answer your questions. 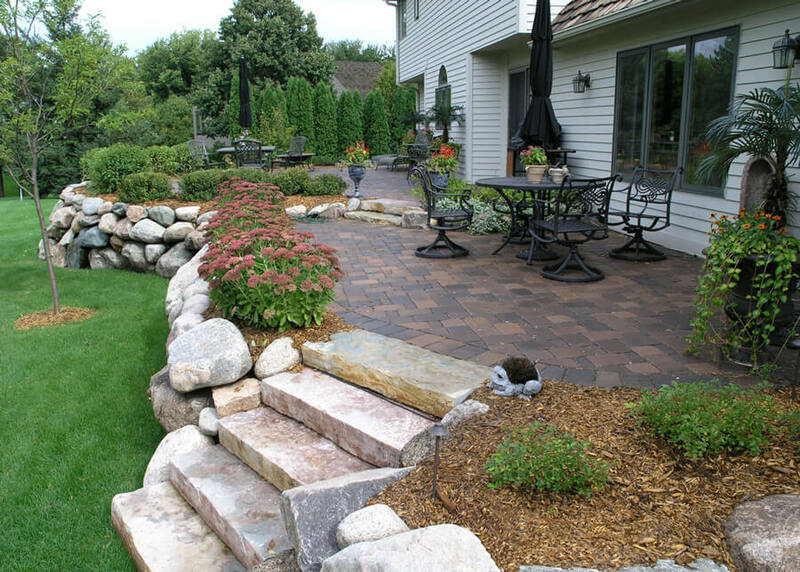 Since 2000, we’ve won 9 awards for Minneapolis area landscape projects, all of which include patio spaces. We’ve been on HGTV twice. A well-designed and installed patio effectively increases the square footage of your home, giving you a comfortable, attractive setting to entertain your family and friends all season long. They also increase your property’s value. A patio is the biggest home-improvement bang for your buck you can get. It’s a good investment for you to use and enjoy, and it pays off later when you go to sell your house. Buyers get excited thinking about sitting on that patio all summer after they move in! Be sure to visit our Paver Patios & Sidewalks Project Gallery to see more photos. Materials – What Do You Use? 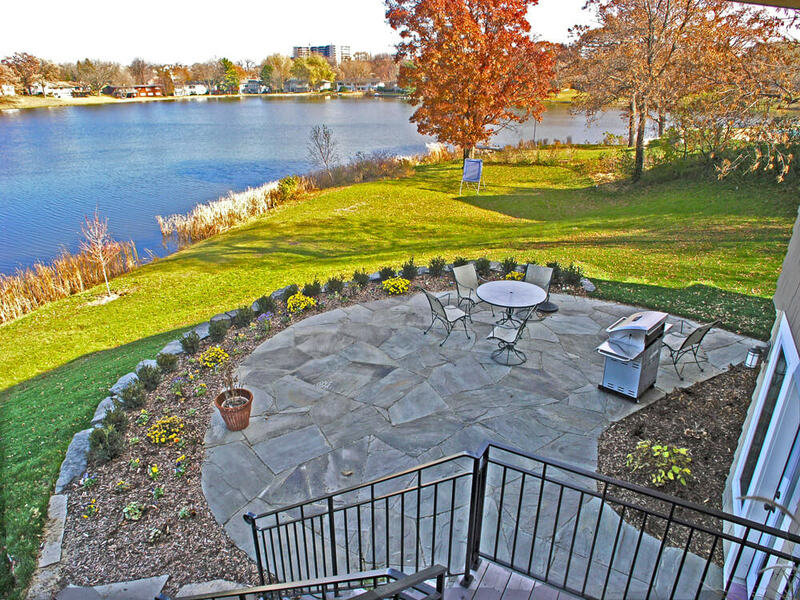 We work with concrete pavers, clay pavers, and natural flagstone. By the way, “paver” is the industry term for brick. Concrete pavers today come in a wide variety of shapes and sizes, some of which rival natural stone in creating a premium look. We’ll help you choose which material will most suit your needs and budget. We’ll design the shape of the patio with the same stylish sensibilities that have won us so many awards. Durability – Do They Last? 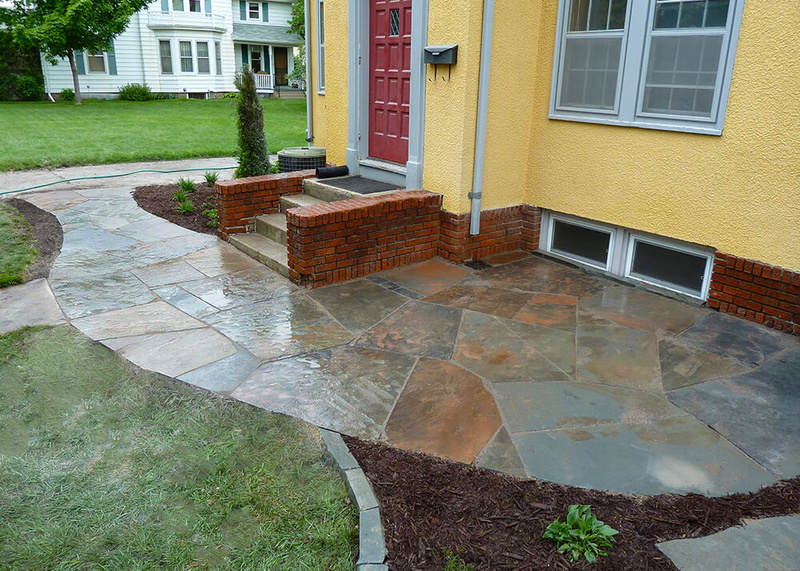 Paver and flagstone patios, when installed correctly, hold up very well. We install 6″ of compacted base material underneath our patios, well over the manufacturer’s recommended minimum of 4″. We also use 400 pound, $6,000 compactors, which few companies own. We don’t believe that a smaller compactor can do an adequate job. 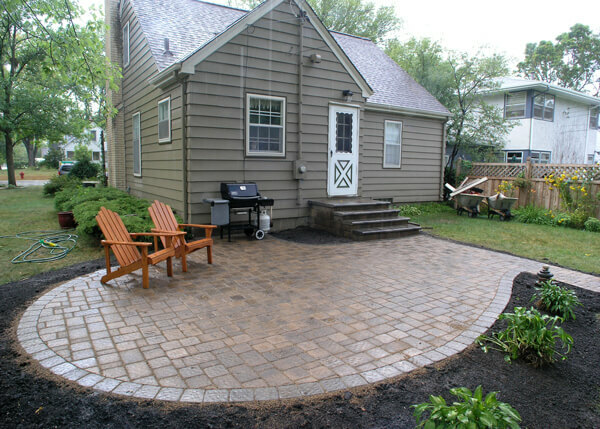 The base preparation is the most important part of a Minneapolis patio, and we don’t skimp on it. We want these things to last a LONG time! Compaction is not the most romantic topic, but it is very important. That’s why we wrote a whole article about it: Why is Compaction so Important? It is extremely rare for a portion of our patios to settle. We have patios that have been in the field over ten years which look as good today as the day we laid them. In the rare case that settling occurs, it happens over the first winter. Typically we can remove a few square feet of affected pavers, add a little sand, and put the pavers back. Our warranty then covers you for a full second winter just to be sure everything is solid, after which you will feel very secure in your investment. Cost – What Is The Price Range? 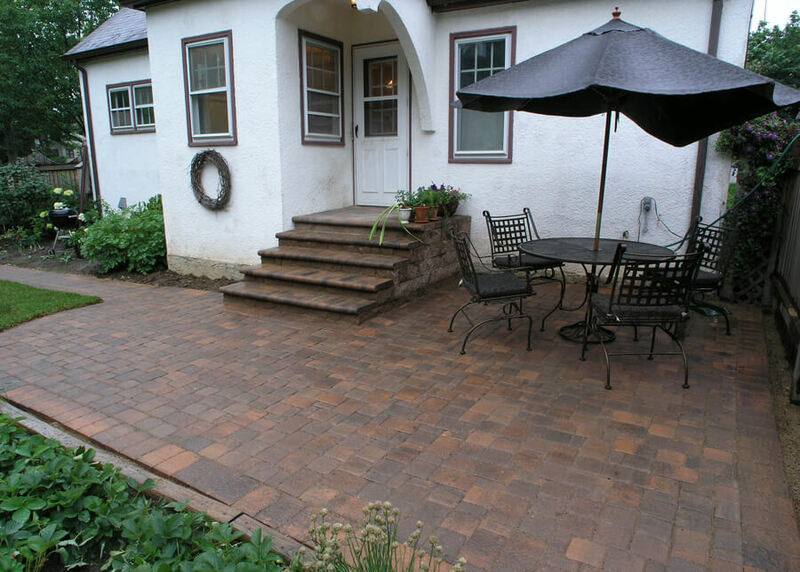 Most paver patios and sidewalks, depending on size and paver selection, will fall between $14-20/Square Foot, although there are some ultra-premium pavers which will cost slightly more, if you choose them for your project. 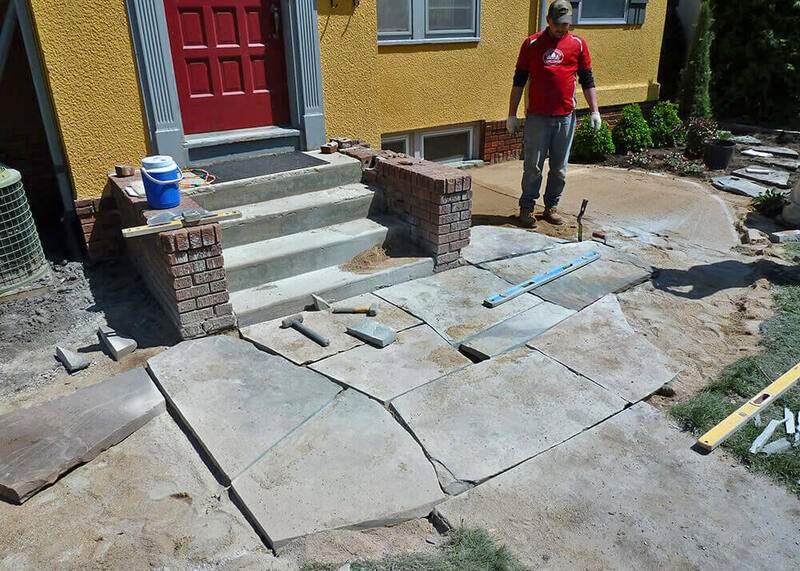 No matter which flagstone or layout you choose, it’s unlikely you’d pay less than $21/SF or more than $36/SF. Flagstone is harder to generalize because there are so many different kinds, layouts, and allowances for different gap widths. Note: These patio cost ranges assume hiring a reliable patio installer who has the proper equipment and experience to build a patio that will last. Patio design, material and layout selection are very important to a successful project, but (forgive us for repeating this) compaction is probably the most critical aspect which gets the least amount of discussion. We'd love for you contact us for a free estimate. 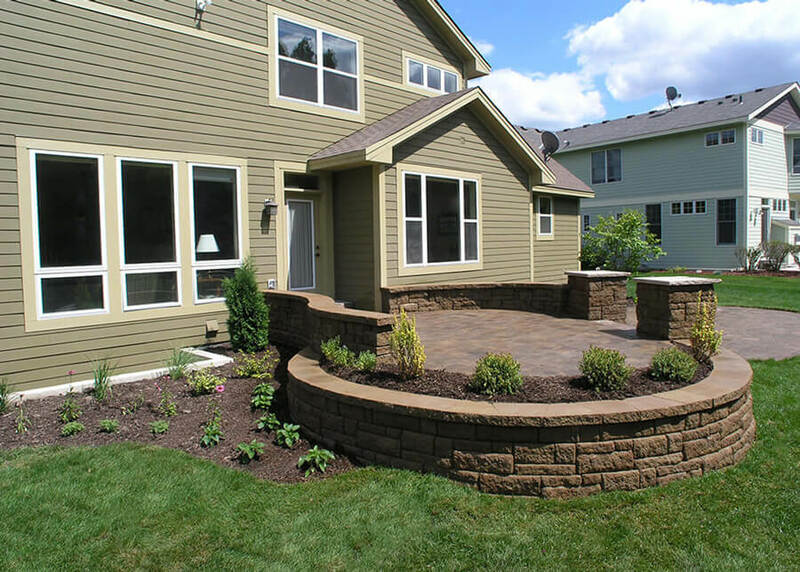 We can usually give you a rough idea over the phone for a simple Minneapolis patio installation, and then schedule a time to meet at your home. The following general guidelines are useful as well. As the old joke goes, there are two types of concrete: concrete that is cracked, and concrete that is going to crack. Concrete and stamped concrete don’t have a heavily compacted base foundation beneath them like our patios do. The freeze-thaw cycle flexes the ground severely, and there’s no way for a big solid slab to withstand it. Paver and stone patios can flex, which solid-poured slabs cannot. The reason concrete has those cut lines in it is so the cracks form initially in the cuts, and not on the slab top. These cracks will happen right away over the first winter. Soon enough the main slab cracks too, separates, becomes unlevel, and there’s no way to repair it invisibly. Poured concrete can only be torn out entirely and replaced. We tear out old concrete all the time. A “quality” concrete installation nowadays costs similar or more than pavers or stone. Concrete prices have come up a lot in the last 6-7 years due to fuel costs, and the cost of the aggregate in the concrete itself. According to the Star/Tribune, Mpls./St. Paul Magazine, and our own experience, regular concrete from a quality installer is now $10-14/SF, and stamped goes from $14-20/SF. 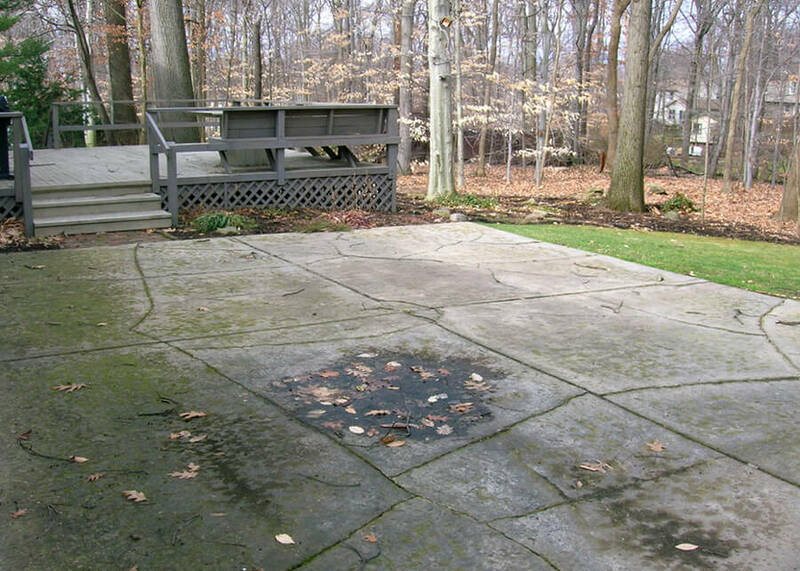 Stamped concrete almost always costs more than the same area done in pavers, and it will crack just as badly as a normal slab. Even if they install lots of extra rebar, this just delays the cracking, and it adds so much cost that you could have had pavers or stone for less. Pavers, on the other hand, have a thick solid base under them, and the surface is made of interlocked pieces which can flex independently with the freeze and thaw. They are cured in ovens, so their PSI strength is typically triple that of a concrete slab. Individual pieces can always be removed and reset or replaced in the future. Stone is on the same solid base and can also withstand winter flexing. With apologies to the poured concrete industry, we just don’t think their product can compete with pavers or stone in terms of cost, attractiveness, or durability. Are we biased? We don’t think we are. Go out and look at concrete anywhere and see how it’s holding up. We have pavers and stone at our house.